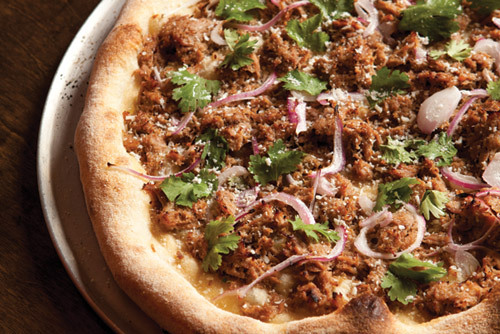 We love this new twist on putting pork on a pizza, perfected by The Flying Squirrel. I have an old friend who insists that a pizza with anything fancy, anything beyond pepperoni and cheese, is “lasagna.” His head would surely explode if confronted with the awesome pulled-pork pizza at The Flying Squirrel: piled high with tender braised pork hunks, sprinkled with fresh cilantro and Cotija cheese, a few ribbons of red onion and then, right before it comes to the table, fresh lime juice for a little lift. It’s the sort of pizza that purists scoff at, roll their eyes about, refuse to order. And then they taste it. The chewy crust, the tender meat, the perfect blend of flavors—lasagna wishes it tasted this good.